What Herbal Products and Nutritional Supplements Do You Need? Trying to figure out what herbal formulas or nutritional supplements you need at the health food store or online can be a difficult task, but we’ve just made it an easier one. After five years of research and development we’re publishing a 454 page reference to help you figure out just what you need. 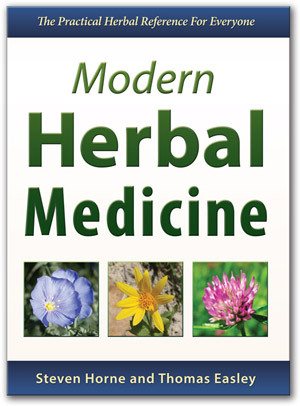 Most herb books focus on single herbs or “do-it-yourself” formulas, but Modern Herbal Medicine is unique. It matches up herbal formulas, single herbs, nutritional supplements and basic natural healing therapies to health problems. It will teach you how to identify the root causes of illness, rather than just treating the symptoms or the specific disease. Plus, it will enable you to compare herbal formulas from different companies and decide which products are right for you. Some of America’s top herbalists have reviewed the book and given their endorsements. Descriptions of 471 Health Conditions, many with detailed descriptions that help you understand the condition, what causes it and how to work on the root causes. Conditions are linked to basic health therapies, herbal formulas, single herbs and nutritional supplements. 239 Single Herb Listings, with a description of the basic uses of the herb, cautions and warnings, basic energetics, properties and which herb companies carry them. Information about 60 Nutritional Supplements, with descriptions of how they are used and appropriate dosages. Listings of 1200+ Herbal Formulas from 30 Herb Companies classified into 102 Product Categories. This system helps you compare herbal formulas in the marketplace and look for the products and dosage forms (e.g. capsule, tincture, glycerite, tea) that work best for you. 33 Basic Health Therapies that are useful for a variety of conditions. Profiles of the 32 Product Companies whose products are featured in the book, including information about their quality control and company philosophy.